At Fornetto we strive towards excellence and creating the most outstanding outdoor cooking experience with our Fornetto Wood Fired Oven and Smoker, as well as with our line of top quality Fornetto accessories and ceramics. When you think of a wood burning oven, pizza often comes to mind and we have a great line of products, everything you need to create mouth watering pizzas, calzones and flat breads right from the comfort of your very back yard. The competition runs from the 8th of January to the 8th of February. Winners will be announced on the 16th of February. The winning recipes will be prepared by our Fornetto chef, professionally photographed and published here on our blog with all the credit going to the winners! A set of our 4 Fornetto Mini Pizza Stones will be shipped free of charge to our top three winning entries. Click on the picture if you need inspiration. You’ll be directed to our recipe and video for our flat breads on our Fornetto website. The recipes must be original and submitted before the 8th of February along with photos of your creation, preferably before (pictures of your raw ingredients as a whole), during the cooking process and your final product. 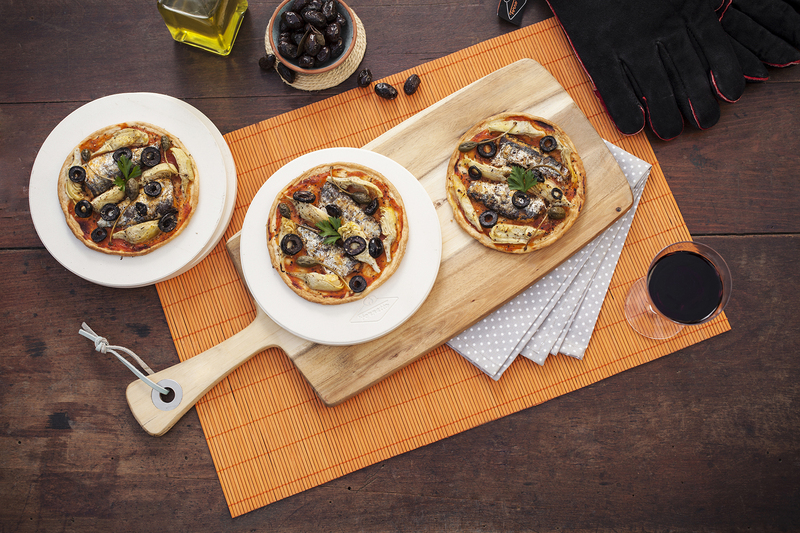 *It is not necessary to cook your creations on mini pizza stones. We ask that you be creative and remember that what could be done on a baking sheet will turn out even better on a stone baking surface at very high temperature. We would prefer the use of a Fornetto oven, a barbecue or a wood burning oven to cook your creations. Conventional ovens are permitted if the weather in your region doesn’t allow for outdoor cooking; we understand that not everyone can be outdoors at this time of year and that not everyone has access to an outdoor kitchen. All entries and inquiries should be sent to competition@fornetto.com with “Mini Pizza” in the subject field. Be sure to include your name, country and city, your recipe and your pictures. Need help finding an amazing pizza dough recipe? Click on the picture!